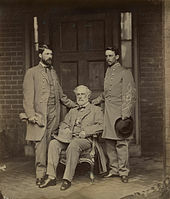 When Virginia declared its secession from the Union in April 1861, Lee chose to follow his home state, despite his desire for the country to remain intact and an offer of a senior Union command. 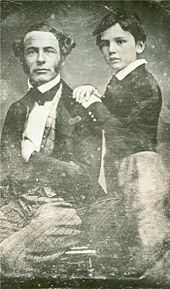 During the first year of the Civil War, Lee served as a senior military adviser to Confederate President Jefferson Davis. Once he took command of the main field army in 1862 he soon emerged as a shrewd tactician and battlefield commander, winning most of his battles, nearly all against far superior Union armies. 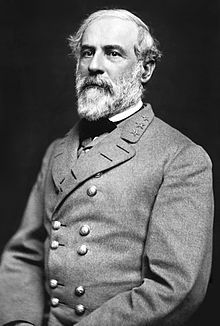 Lee's strategic foresight was more questionable, and both of his major offensives into Union territory ended in defeat. 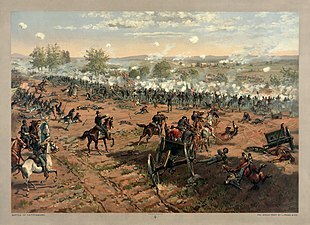 Lee's aggressive tactics, which resulted in high casualties at a time when the Confederacy had a shortage of manpower, have come under criticism in recent years. Lee surrendered his entire army to Ulysses S. Grant at Appomattox Court House on April 9, 1865. 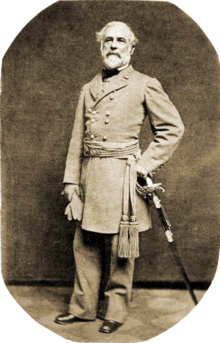 By this time, Lee had assumed supreme command of the remaining Southern armies; other Confederate forces swiftly capitulated after his surrender. 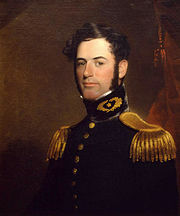 Lee rejected the proposal of a sustained insurgency against the Union and called for reconciliation between the two sides. ^ Emory M. Thomas (June 17, 1997). 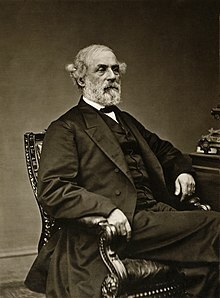 Robert E. Lee: A Biography. W.W. Norton. p. 173 (paragraph 4). ISBN 978-0-393-34732-6. ^ a b J. William Jones (1906). 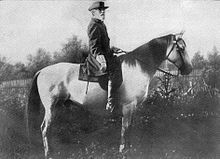 "Robert E. Lee to George Washington Custis Lee" (PDF). 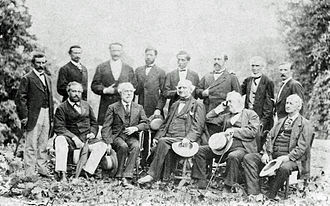 The Civil War: The First Year Told By Those Who Lived It. The Library of America, 2011. Retrieved November 19, 2016. ^ In December 1882, the U.S. Supreme Court returned the property to Lee's son because it had been confiscated without due process of law. In 1883, the government paid the Lee family $150,000. 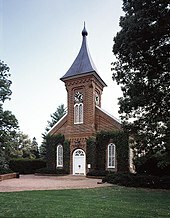 "Arlington House, The Robert E. Lee Memorial". Arlington National Cemetery. Retrieved May 20, 2008. Lee, Robert E. (1897). 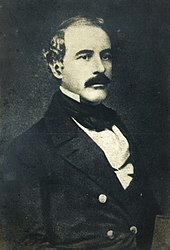 A. L. Long (ed.). 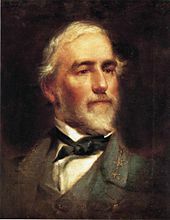 Memoirs of Robert E. Lee: his military and personal history. New York, Philadelphia, J. M. Stoddart & company.